Disgraced Athletes Who Lost Their Endorsements: What Happened? People of all ages and backgrounds look up to athletes as people who applied themselves to a goal and managed to turn their obsessions with being the best into a money-making machine. But that obsession with winning, or belief that being the best makes you untouchable, can get major sports stars into trouble. There are disgraced athletes in almost every sport, from football to track and field, and most of their stories have the same sad trajectory of a local kid making good and then getting in over their heads. But some of the athletes who lost endorsements went above and beyond what actually has to be done to become a disgrace and went down in history as some of the craziest athletes to ever embroil themselves in sports controversies. But what happens to athletes who were banned from their sport? Do they get a day job? Or is there hope of competing again? In the sports world, it’s really hard to lose an endorsement. Some athletes who’ve made a second career out of misbehaving have managed to hold onto their endorsement money without so much as Coca-Cola or Nike batting an eye. That means the sports figures who lost endorsements had to go above and beyond the pale to anger someone in their PR company. Of all the athletes who lost all their money, the number one cause of a corporate smackdown is drugs, but as you’ll soon find out there are plenty of interesting ways to bring disgrace to the world of sports. The Fall: Lance Armstrong was the great American hope for cycling. No one had ever cycled quite like him, and when he overcame cancer to win all of the Tour de Frances, it was inspiring, not just for Americans, but for mankind. But in 2005, after his seventh Tour de France win, a report was released alleging that EPO (an endurance-enhancing drug) was found in Armstrong's blood all the way back in 1999. Armstrong fought this claim until 2012 when he kind of gave up and admitted that he was one of the cyclists leading the charge for doping. The Fall: After once again winning all of the swimming medals at the 2016 Olympic Games in Rio, Ryan Lochte and few other Olympians went out and... something happened? Lochte and his buddies told police and pretty much anyone else who would listen that they were robbed at gunpoint at a convenience store, but when footage of the "robbery" appeared, it just showed a blackout-drunk Lochte and company fighting with a security guard and breaking down a bathroom door. What Happened After That: Lochte said that he was "110% sorry," but that didn't stop Speedo, Polo Ralph Lauren, Syneron Candela, and Airweave from removing Lochte from their sponsorship roster, costing him a lot of money. The Fall: O.J. Simpson was one of the greatest all-time running backs in the NFL. He was a two-time All-American, a Heisman Trophy winner, a three-time player of the year, and he was voted the NFL's most valuable player in 1975. Outside of football, he acted in the Naked Gun series and he was a spokesman for Hertz Rent-A-Car, which featured Simpson in adds that said, "Go, Juice Go!" But in 1994, his estranged wife and her friend were found stabbed to death outside of her Brentwood home and Simpson was the primary suspect. What Happened After That: First of all, Hertz dropped him like a sack of rocks, and then the trial of the century began. The trial went on for over a year, and in that time, the public's view of Simpson changed from a former star athlete to a controlling, lecherous husband. Even though Simpson was acquitted of the murder, he was still found to be liable in a civil case, and then a $1.44 million tax lien was placed on his assets. Somehow, this would be just the beginning of Simpson's legal troubles. The Fall: Aaron Hernandez was a highly successful football player but ended up in jail for murder. In addition to being charged with a double homicide in 2012, a jury convicted Hernandez of the murder of Odin Lloyd in 2015. Lloyd was a semi-pro football player. Hernandez shot and killed Lloyd in an industrial park about one mile away from Hernandez's house. 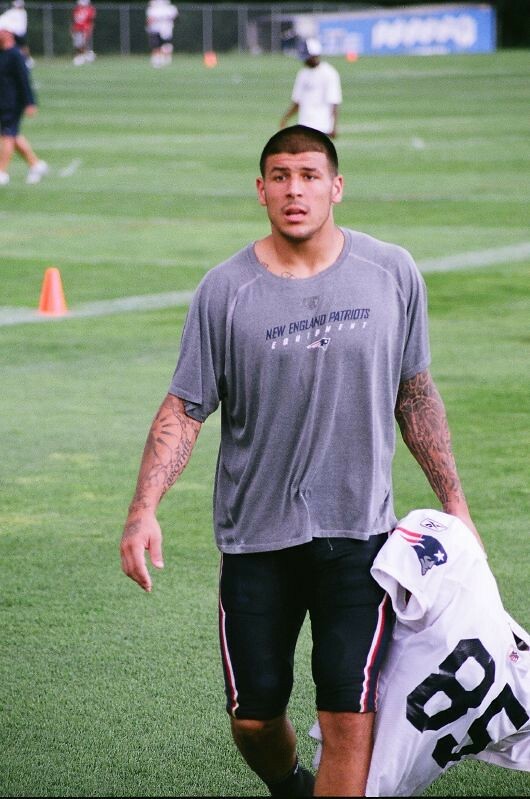 What Happened After That: About 90 minutes after Hernandez was arrested, the Patriots cut him loose from their roster and a wave of endorsement deals crashed down around him. CytoSport, Puma, and EA Sports all dropped their endorsements, and the University of Florida removed Hernandez's name and likeness from various locations at its football facilities. For his crime, he was sentenced to life in prison. On April 19, 2017, guards discovered Hernandez dead in his prison cell. Hernandez had hung himself from a bed sheet earlier in the morning.